I don’t work downtown but if I did, I might consider CASA more readily as a potential hang-out spot. The restaurant invited us bloggers to an evening of drinks, tasty treats and merriment on them. They were attentive to us and didn’t disappoint. The treats (yes, they were bite-sized and were eaten off small plates) rolled out one-by-one. CASA presents a quality, updated interpretation of Mexican food that embraces its urban, downtown surroundings. Presentation was clean yet didn’t diminish savoriness. A favorite of mine was the shrimp tacos – which aren’t on the online menu at the present but you can find them on the paper menu (Tacos de Carnaronas Fritos). 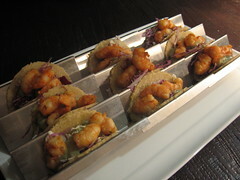 The prawns used were substantial and each taco bite was even a tad spicy thanks to a little green chile. 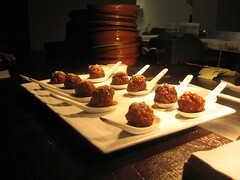 And then came the Mexican meatballs, or albondigas (pork and beef meatballs with a smoky tomato sauce and queso cotija). They were tender and cooked to just the right consistency, seasoned just a tad sweet. The crowd favorite was definitely the queso flameado (tequila-flamed queso asadero, chanterelle mushrooms, epazote) which came with house-made flour tortillas. It’s brought in with a flame burning the top off. En fuego! The tortillas were no detail. Like they challenged the quesadilla and gave you the pleasure of scooping cheese into your warm, baked tortilla. We also had a handful of drinks to choose from as far as washing the aforementioned down. I had a couple passion fruit mojitos which were just right – not too sweet. After that I followed up with a lavender margarita. Delicious. Â The lavender was a nice touch and subtle – not too much. 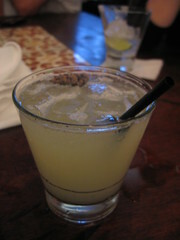 They also had a smokey margarita (I tried my friend’s) but I thought it was a bit too overpowering. Good thing the food and other drinks, overall, were enough toÂ tickle my palate. Parking is validated for dinner. 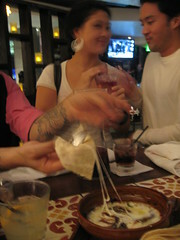 This entry was posted in Downtown LA, Food, Happy hour and tagged CASA, Downtown LA, Mexican food. Bookmark the permalink.